The United States honors the American veterans of every major conflict of the 20th century with a national memorial in Washington, D.C. – except the veterans of World War I. With your help, that can change. Completely funded through private donations, the World War I National Memorial can only be completed with the support of Americans like you. Join the thousands of Americans who have already contributed to make the Memorial a reality. Every American who served deserves to be honored, and with your help, they will be. This entry was posted in World War One Centennial Commission and tagged World War One Centennial Commission on December 31, 2018 by Michael K. Barbour. This New Year’s week, and next week, we have a two-episode special for you. We have pulled together some of our favorite stories and segments from 2018! They are presented in chronological order. Part 1 comes out this week – the last week of 2018, and Part 2 will publish next week – the first week of 2019. Learn all about WW1 and the centennial while you drive, work or play. This entry was posted in World War One Centennial Commission and tagged World War One Centennial Commission on December 30, 2018 by Michael K. Barbour. Take a First Look at the National World War I Memorial, Washington, D.C.
A Virtual Tour of the National World War I Memorial is Now Live! Last month the public had the opportunity to tour the site of the National World War I Memorial in D.C., and to see firsthand how the site will look when completed. Now, you have the opportunity to do the same. The virtual Site Walk-Through allows you to see what the Memorial will look like when completed, right from the comfort of your own home. Click the button below to experience what it will be like when the National World War 1 Memorial in our Nation’s captial is completed and open to the public. This entry was posted in World War One Centennial Commission and tagged World War One Centennial Commission on December 29, 2018 by Michael K. Barbour. Greetings and happy Boxing Day from Berkeley! We are reaching out to let you know what we’ve been up to in 2018. Canadian Studies was thrilled once again to support the work of our talented Hildebrand Fellows. They are Berkeley graduate students conducting research in Canada, or on Canadian topics. Three fellowship recipients presented this month: Kimberly Huynh (Civil/Environmental Engineering), Desiree Valadares (Architecture), and Alexandra Havrylyshyn (former Fellow, current Post-Doc at Berkeley Law). This year Canadian Studies also supported the work of Martha Herrara-Lasso Gonzáles (Theater, Dance, and Performance Studies), Erika Brown (School of Public Health), and Tyler Nodine (Landscape Architecture and Environmental Planning). 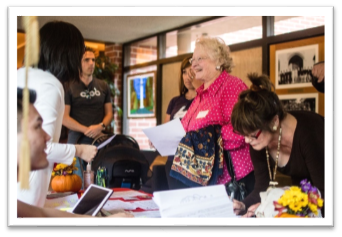 In October, Canadian Studies was also delighted to partner with the Digital Moose Lounge to present the 2nd Annual Canadian Family Thanksgiving at Alumni House. A sell-out crowd of over 100 Canadians and friends of Canada gathered to celebrate Canadian Thanksgiving, network, and enjoy Canadian food and beverages. A major highlight of the year was the visit of legendary Canadian author Margaret Atwood, to campus in August. 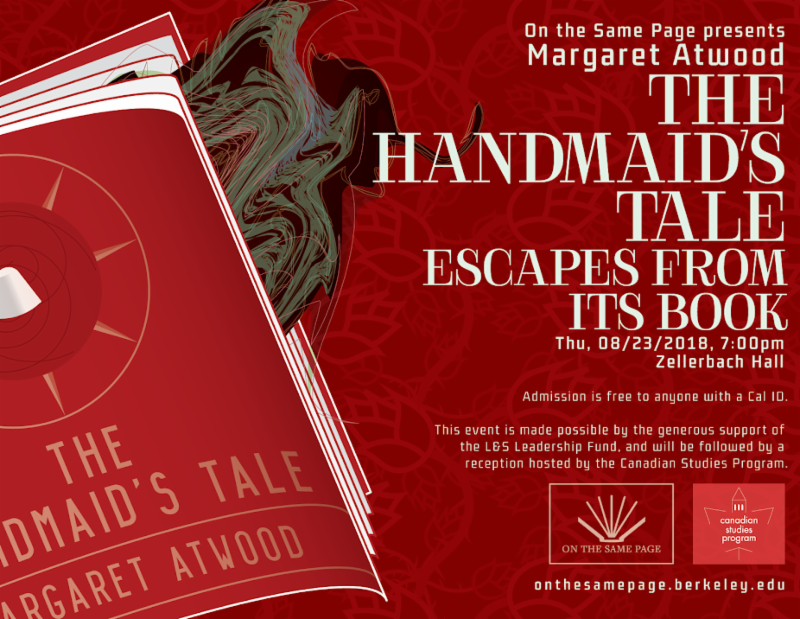 Canadian Studies partnered with the College of Letters and Science to host a reception following Ms. Atwood’s talk, entitled “The Handmaid’s Tale Escapes From Its Book.” Several hundred students and members of the community enjoyed a witty talk by Ms. Atwood, and a festive reception in Lower Sproul Plaza afterward. The 2018 Thomas Garden Barnes Lecture was delivered in April by Elizabeth May, MP, the leader of Canada’s Green Party. Ms. May discussed “Can Canada Claim Climate Leadership? Can the Paris Accord Succeed in Avoiding the Worst of the Climate Crisis?” The late Professor Thomas Barnes might not have agreed with all of Ms. May’s views, but he would have been delighted to have Canadian Studies in the thick of debate, whether scholarly or on key contemporary public policy issues. This reflects Tom’s vision of Canadian Studies as a “big tent,” welcoming diverse viewpoints and disciplines. Also to that end, Canadian Studies hosted a panel discussion on NAFTA in February. Academics and practitioners discussed “North American Futures: NAFTA in the Balance.” Canadian Consul General Rana Sarkar moderated with Dr. Christopher Sands (Canadian Studies, Johns Hopkins University), Maria Echaveste (UC Berkeley Earl Warren Institute on Law and Social Policy) and Jeremy Kinsman (former Canadian Ambassador). 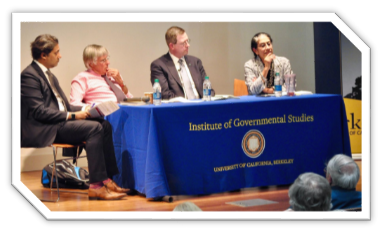 Some audience members said it was the most intellectually stimulating discussion they had heard at Berkeley. Looking ahead, on January 29, the 2019 Thomas Garden Barnes Lecture will be delivered by Jean-Frédéric Morin, Fulbright Visiting Research Chair of Canadian Studies and Associate Professor at the Political Science Department of Laval University. Finally, we want to take a moment to thank you for your ongoing support of Canadian Studies. Over 90% of our annual budget comes from the generosity of friends and donors like you, who care about making sure that the academic study of Canada remains a vibrant part of the intellectual life of the University. If your family is considering end-of-calendar-year gifts to causes you champion, we hope you will consider including Canadian Studies in your giving. 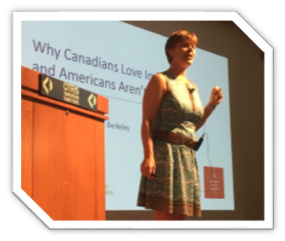 UC Berkeley is a Revenue Canada Prescribed University and an Internal Revenue Service 501(c)(3) nonprofit, so contributions made to Canadian Studies may be tax-deductible on American and Canadian federal income taxes (consult your tax professional). Contributions can be made securely online via credit card at canada.berkeley.edu/donate or via check in US or Canadian funds made out to “UC Regents” and mailed to the address below. 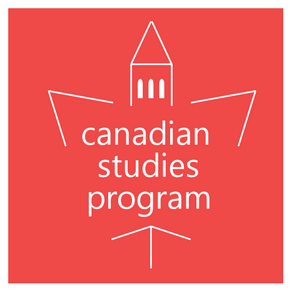 Since 1982, the Canadian Studies Program at the University of California, Berkeley, has served as an intellectual hub for thought on Canada and Canadian-American issues. We were honored to carry that legacy throughout 2018, and look forward to continuing that work in 2019. In the meantime, we wish you the happiest of holidays. Please know that we are grateful for your ongoing support of Canadian Studies at Berkeley. We couldn’t do it without you. This entry was posted in Canadian Studies Program UC Berkeley and tagged Canadian Studies Program UC Berkeley on December 26, 2018 by Michael K. Barbour. In December of 1918, the 353rd Infantry, 89th Division, was assigned to the area of Prüm, Germany, as their final area of occupation, after a long march of two hundred forty kilometers through snow and cold, beginning on November 24th, from Stenay, France, through Belgium and Luxembourg into Germany. Billets for the officers and enlisted men of the regiment were found in local German civilian homes, and a certain amount of resentment from the local population was anticipated by the U.S. forces. But on December 25, 1918, George A. Carlson, a young American soldier from Denver, Colorado, found that the violence and suffering that the war had brought to the tiny village of Philippsheim had not extinguished the Christmas spirit there. Nearly a century later, George’s grandson visited Germany to follow his grandfather’s footsteps in the war. Click here to read about the amazing encounter that took place in Philippsheim, an unlikely gift from a Christmas observance that took place 100 years ago. The U.S. Mint’s collectible 2018 World War I Centennial Commemorative Silver Dollar is only officially available for two more days after Christmas: The coin goes off-sale at the Mint on December 27, 2018 at 11:59 PM EST. 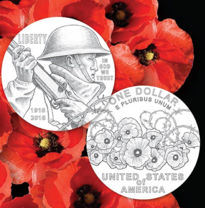 Buying this collectible coin helps the United States World War I Centennial Commission to build the new National WWI Memorial in Washington DC. Here is how it works. Congress authorizes commemorative coins that celebrate and honor American people, places, events, and institutions. Although these coins are legal tender, they are not minted for general circulation. Each commemorative coin is produced by the United States Mint in limited quantity and is only available for a limited time. As well as commemorating important aspects of American history and culture, these coins help raise money for important causes. Part of the price of these coins is a surcharge that goes to organizations and projects that benefit the community. Click here to read more about how your purchase of this historic commemorative coin will help build the long-overdue national memorial for our WWI Veterans in the nation’s capitol. The World War I-era Battle Cruiser USS Olympia (actually built in the 19th Century) played a significant role in WWI, providing naval support, helping with convoy duty, and bringing the Unknown Soldier home from France. The ship continues in her duties, as she uniquely tells the American World War I story in her role as a museum ship in the City of Philadelphia. Last month, Olympia played host to a special Armistice Centennial ceremony that included participation in our Bells of Peace effort. We had a chance to hear about it from Denise Krepp, who is part of the Cruiser Olympia’s staff. The Westford (MA) Museum knew they wanted to honor the past with their annual contribution to the local Festival of Trees, so they chose a colorful and solemn expression of remembrance, 100 handcrafted poppies. 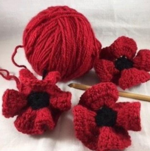 The poppies were crocheted and knitted by 15 crafters, Westford residents and volunteers known to the museum. Westford Museum’s newest director Linda Greene said having the poppy Christmas tree featured at during the Westford Regency’s festival was not only a way to embrace the holiday season, but pay homage to the 100th anniversary of the end of World War I. Click here to read more about this innovative yet traditional approach to remembering the service of American in WWI. 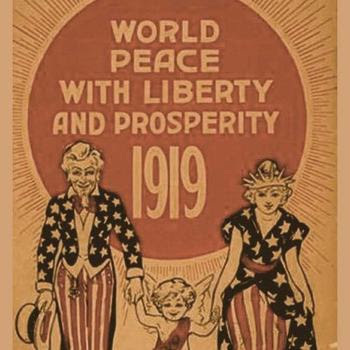 On Wednesday, January 16, 2019, the John W. Kluge Center at the Library of Congress will host a panel discussion to mark the 100th anniversary of the Paris Peace Conference, “The United States and the World: Legacies of the Paris Peace Conference.” The symposium will be held at 3 p.m. in room LJ-119 of the Library’s Thomas Jefferson Building, 10 First St. S.E., Washington, D.C. This discussion will explore the legacies of a pivotal period in world history, including themes of Wilsonianism, the ideological origins of the United Nations, the projection of American power and a new international order. Click here to read more about this upcoming event, and how you can secure your free tickets. Mark Simone is a successful young post-production specialist in Hollywood. He was the lead for his company, Stereo D, in their work with the Peter Jackson WWI documentary, THEY SHALL NOT GROW OLD. Mark’s job was to bring the film alive in 3-Dimensional imaging. Mark’s company, Stereo D is an award-winning, recognized leader in high-quality conversions of 2D theatrical content into stereoscopic 3D imagery, working with major award-winning motion picture studios and filmmakers to bring their vision of 3D storytelling to the screen. We got a chance to talk to Mark about the film, and his experience working on it. this remarkable World War I film! 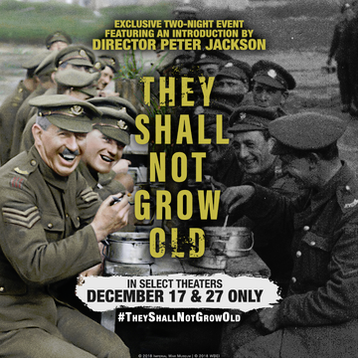 Fathom Events has partnered with Warner Bros. Pictures to bring Academy Award® winner Peter Jackson’s poignant WWI documentary “They Shall Not Grow Old” to select cinemas on December 27 only. The film is presented in 2D and RealD 3D. 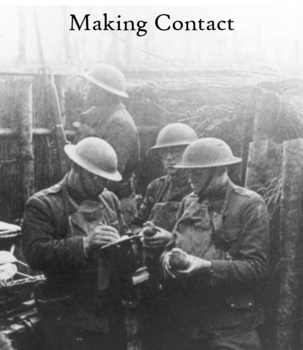 The acclaimed documentary is an extraordinary look at the soldiers and events of the Great War, using film footage captured at the time, now presented as the world has never seen. By utilizing state-of-the-art restoration, colorization and 3D technologies, and pulling from 600 hours of BBC archival interviews, Jackson puts forth an intensely gripping, immersive and authentic experience through the eyes and voices of the British soldiers who lived it. For tickets, visit FathomEvents.com. This is our 2018 Holiday music special. We have compiled a collection of WWI era holiday music. It includes popular Holiday music of the time including some German, French, British and Italian pieces and even a modern day rendition of I’ll be home for Christmas courtesy of the contemporary WWI musicians, Baritone John Brancy and pianist Peter Dugan. Mediated memory is a term that means representations of the past that are transmitted through modern media and affect the construction of personal and/or collective memory. This week, at WWrite, English Research Historian and social media expert, Anna Rindfleisch, discusses this concept in the context of WWI through an analysis of a British Sainsbury’s advertisement featuring the 1914 Christmas Truce. 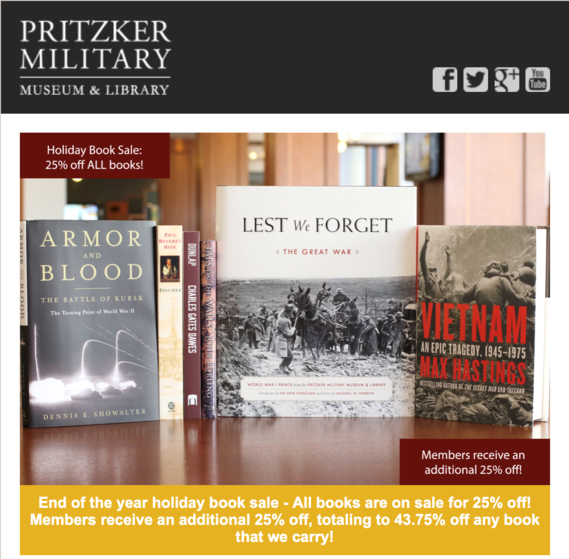 Read this inventive post about the Christmas Truce, revisited, at WWrite this week! Inspired by the iconic image of a U.S. Doughboy, you can wear your American pride with this Made in the USA hat. The poignant lone silhouette of a soldier in trench warfare serves as a reminder of those who sacrificed so much one century ago. 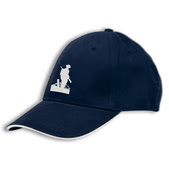 The Navy hat with white Doughboy embroidery is a 100% cotton, structured with contrasting pancake visor, sweatband and taping, and pre-curved bill. The velcro closure features U.S. flag emblem. A Certificate of Authenticity as Official Merchandise of the United States World War One Centennial is included. Order your Doughboy Commemorative hat here. 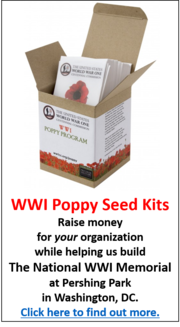 This and many other items are available as Official Merchandise of the United States World War One Centennial. 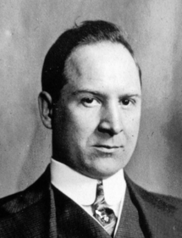 Proceeds from the Official WWI Centennial Merchandise help to fund the building of the national World War One Memorial in Washington, D.C.
That building still stands as far as I know on Market space near the inner harbor. I still have a badge my father wore. Read John William McGrain, Sr.’s entire Story of Service here. This entry was posted in World War One Centennial Commission and tagged World War One Centennial Commission on December 25, 2018 by Michael K. Barbour. 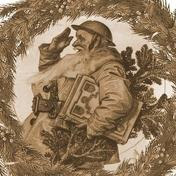 This is our 2018 Holiday Music Special featuring a collection of WWI era Holiday music. We included popular holiday music of the time including some German, French, British and Italian pieces, some spoken word pieces and even a modern day rendition of “I’ll be home for Christmas” courtesy of the contemporary WWI musicians, Baritone John Brancy and pianist Peter Dugan. Please enjoy this century old ambiance and give a moment of thought and gratitude to those boys 100 years ago that were just waiting to come home to their loved ones! This entry was posted in World War One Centennial Commission and tagged World War One Centennial Commission on December 22, 2018 by Michael K. Barbour. On behalf of the Wreaths Across America organization and its extended family of volunteers and supporters across the country, we want to thank you for your support and commitment to the Mission to Remember, Honor and Teach. With each of the nearly 1.8 million sponsored veterans’ wreaths placed last weekend, an American hero’s name was spoken out loud so they would not be forgotten. There was also an opportunity to teach, not just the children, but the communities as a whole, about their local history and heritage. As we head into this holiday season, may we all take the time to remember and thank those who served and sacrificed protecting our freedoms, as well as those currently serving, so that we can celebrate as we wish in the land of the free because of the brave. On Saturday, Dec. 1, Wreaths Across America placed 9,387 Maine-made, balsam veterans’ wreaths on the headstones of all U.S. service members laid to rest at Normandy American Cemetery and Memorial, located in Colleville-sur-Mer, France. For the Gross family, this year’s visit to place a veteran’s wreath on the headstone of their son and brother, US Army CPL Frank R. Gross, was also part of a mission of healing and strength for another wounded warrior. Together they braved the weather and crowds to place a wreath and say Frank’s name, together. National Wreaths Across America Day is an event, but Wreaths Across America is a year-round mission to Remember the fallen, Honor those that serve and their families, and Teach the next generation about the value of freedom. It is never too early to get involved. From from our Remembrance Tree Program and the Remember Wall, to Fundraising Groupsand volunteering to place wreaths, there are a number of ways to get involved locally. This entry was posted in Wreaths Across America and tagged Wreaths Across America on December 21, 2018 by Michael K. Barbour.